Richard Spencer (see terrible human being) was sucker punched in the face on the streets of Washington whilst attempting to give an interview to camera last week. This assault has been instructive insofar as it’s helped to separate the pro-free speech liberals from the thuggish ideologues within my own circles. In fact, I barely would have bothered to offer an opinion on this incident had it not been so widely endorsed and gleefully celebrated by people who should really know better. 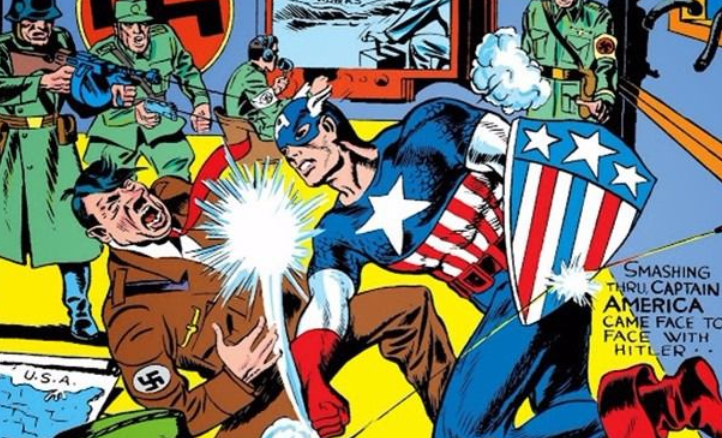 This excellent and droll analysis from Popehat summarises my own position on the whole ‘should we punch Nazis?’ conundrum. Needless to say, when reasoned analysis such as this has been put forward, those making it are accused of ‘defending genocide/Nazism/white supremacy’ or sent memes of Captain America punching Hitler. When exactly did rational thinkers start appealing to the authority of comic book characters? 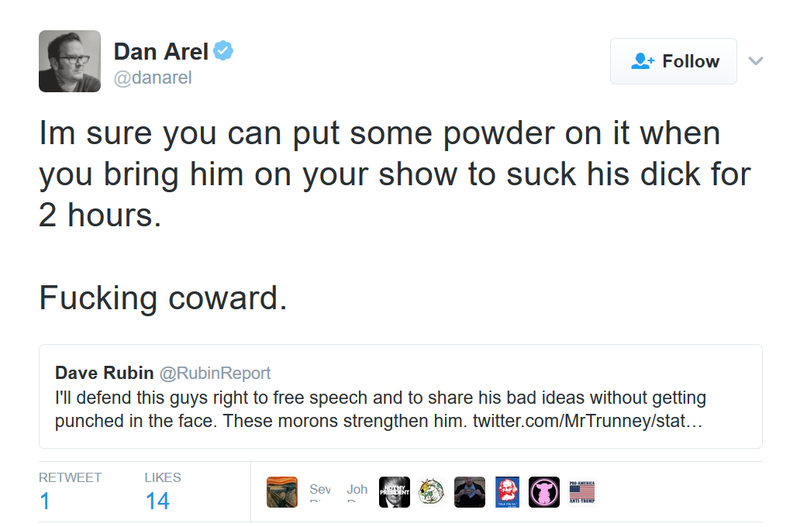 One example of someone failing to reason like a rational adult on this topic of sucker punching people in the face is ‘award-winning’ journalist Dan Arel. After openly endorsing violence for those who speak their mind in a way with which he disagrees, Dan did not take well to me pointing out that he had previously said ‘resorting to violence was for the ‘weak and uneducated’. Or that he had also said ‘if you need violence to to enforce your ideas. [SIC] your ideas are worthless’. Arel decided to respond to this charge of hypocrisy by reaching into his magical bag of fictional wrongs to claim that I have at some point expressed a desire to ‘deport all Muslims’ from Britain. Where? When? There are people who do think like this of course, I’m just not one of them. And I’ve argued against them on many occasions. And I hope to do so again. When Dan is not endorsing violence for speech, or throwing around profane insults, or tweeting sexually aggressive abuse to a gay man on Twitter, he finds the audacity to accuse me of being a ‘career bully’. This is odd given that he had reached out to me as recently as October 2016 to ask to promote his new book on my podcast. I suppose one must abandon their principles on the evils of bullying if the bully in question is willing to help your wallet. People who should know better aside, I also have a loyal gaggle of anonymous trolls who tweet me (see send abuse) almost daily. This is perfectly fine with me as the ‘mute’ and ‘mute conversation’ options have rendered such people impotent. Plus, I do enjoy the knowledge that I’m able to annoy them this much. After days of trying to get people to appreciate the importance of complex rights such as freedom of speech, I think I deserve some downtime to enjoy shooting fish in a barrel. 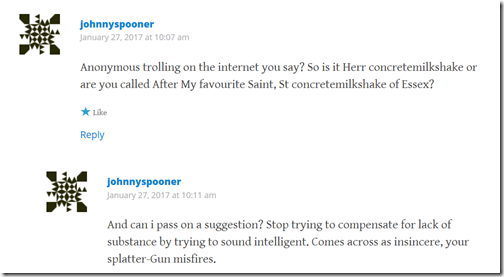 ‘Johnny Spooner’ (aka @TheFlowerThrower, @Lifg_4_Hrc and @Pc_snowflake) seems to change his twitter handle after each embarrassment. His documented humiliations include lying about the chapel hill murders, defending racist rhetoric and exposing his ethical hypocrisy. The best he can hope for in life is a retweet from CJ Werleman. Tragic. In order for ‘Johnny’s’ worldview to align with reality, he needs me to be a racist, anti-Muslim white supremacist. Unfortunately for ‘Johnny’, there’s no evidence of any of this in my words, behaviour or output. He therefore has no option but to take aim at the views he wishes I held. He’s cobbled together a blog in which he attempts to paint me as a hypocrite on the topic of free speech and violence. It will come as no surprise that this requires weapons grade levels of misrepresentation and muck throwing. I’ll address the accusations one by one. Please take note how I don’t need to misrepresent a single thing he’s claimed to show that it is a calculated lie. I can simply just highlight what he claims I said and place it right next to what I actually said. The claim is made that I am ‘comfortable with violence against Muslims’. No examples of me expressing such sentiment are provided, instead, he attempts to back this claim with guilt by association – namely that I ‘worship’ Douglas Murray, Ayaan Hirsi Ali and Christopher Hitchens. There is also no evidence provided of those people advocating violence against Muslims for what they say either. In case there is any doubt – don’t assault Muslims (or anyone) for saying what they think. To him, a regretful Iraq War protestor, his misjudgement was based on “naive commitment to pacifism” he continues “I’ve since grown up to discover that the world is a scary place and that pacifism just won’t do if you wish to prevent scary people from getting their way.”…But don’t punch Nazis…??? Do I really need to point out there is a difference between a ‘scary’ person such as Saddam, with a regime that has committed actual genocide than some obnoxious person with a terrible haircut espousing their disgusting views? Yes, definitely don’t punch the latter. 3 An insistence to ‘silence Muslims’. Mr. Bukhari should never again be afforded a platform on a national news network. One thing should be absolutely clear: groups such as CAGE should not be within a million miles of that conversation. Theirs is destructive criticism. They want all opposition to extremism to fail. Let’s put aside for the moment that I have interviewed and promoted a number of secular Muslim voices on my podcast and blog and am proud of doing so. That’s how free speech works. I am free to ‘suggest’ he should not be considered a trusted or credible source for news journalism. This is a man, who upon noticing one of his shoes had gone missing from his home, blamed ‘the Jews’ for its theft. What I am not ‘free’ to do however, is smack Mr. Bukhari in the kisser, or prevent him from entering a news studio for an appearance he has been invited to make. None of which I have advocated or would defend. He can say what he likes. And I can say what I like about it. I can use my speech to try and convince news editors that he has no credibility. This is called ‘argument’, not censorship. And it’s certainly not called hypocrisy given I respect his right to do the same. In response to the second point about the Islamist organisation CAGE, you can read my views in full here. I’m scratching my head as to how my criticism of them is an attempt to shut down ‘free speech’. CAGE have a right to say what they want and I’m saying they should not be within a million miles of the conversation on government, terror legislation – which was the entire focal point of my opinion piece on them. Are we saying they must be allowed direct input on this legislation, lest their free speech be impeded? Imagine the USA was drafting some new race equality legislation and I said ‘groups such as the KKK should not be within a million miles of that conversation’. 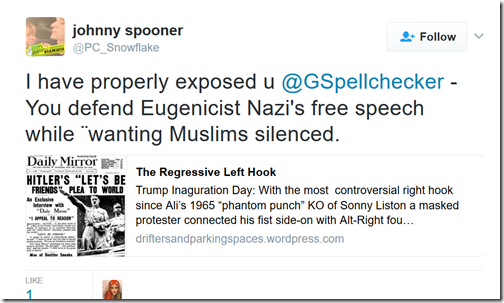 Neither should Richard Spencer or his affiliates for that matter. Would ‘Johnny’ accuse me of shutting down their free speech, or holding hypocritical views on the topic? I think not. I’ll continue to pray to the troll gods that my ‘critics’ remain this inept and so utterly flustered by my existence. Better luck next time. UPDATE 25 Jan 2017 – Turns out Mencken had some overtly sinister white supremacist views of his own, rather than simply being the celebrated satirist that I’d taken him for. Rather than delete (and be accused of hiding my mistake) I shall leave the quote in place and simply be more careful of whose words I amplify in future. 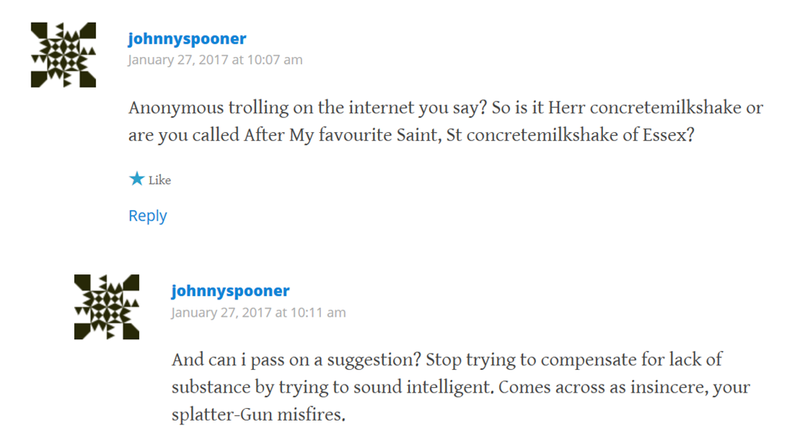 The abusive, anonymous Twitter troll ‘Johnny Spooner’ has now responded to this blog piece here. As expected, he doesn’t attempt to address any of the points above, or retract his demonstrably false claims – instead, he opts for more Gish Gallop and even more attempts at guilt by association. Stephen was fully aware of Menken’s appalling racism. He chose to quote him because he’s sympathetic to those views and wanted to out himself publicly in the very same article in which he describes racism as “obnoxious” and “disgusting”, and racists as “terrible human beings”. That’s your opening argument? That’s too ridiculous for even you to believe. You don’t believe it. It’s a cheap-shot over a mistake that you didn’t have the self-restraint to ignore. Many people don’t know that Roald Dahl had some pretty unsavoury views about Jewish people. I’m sure the next time you hear anyone mention any of his work approvingly you’ll pounce on them as being a closet anti-Semite or at least abjectly unqualified to express opinions on the subject. Or what about if someone reveals that the late Muhammad Ali – a proponent of segregation, an opponent of interracial relationships, and a member of the avowedly racist Nation of Islam – is one of their favourite Americans? Your point is nothing more than: “He didn’t know Menken was a racist. Lol.” That’s it. Not an argument. 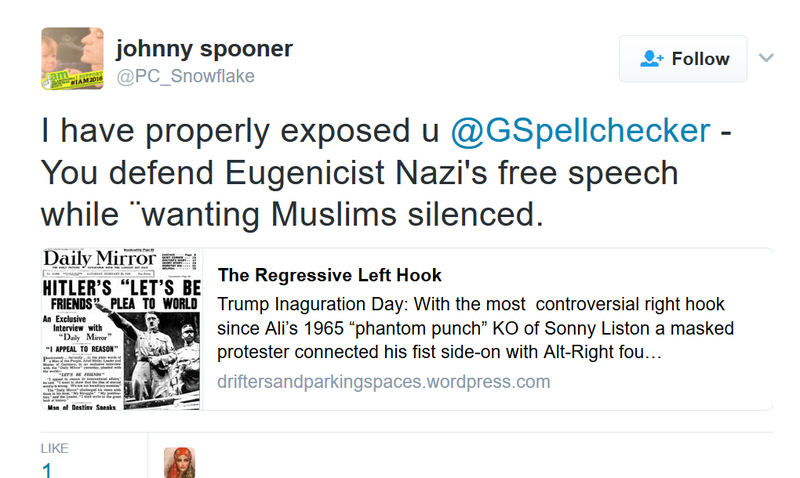 “Spencer’s speech is not speech.” This actually is an argument, but a self-evidently stupid one. Unless Spencer has been involved in carrying out eugenics, forced sterilisation, ethnic-cleansing and the creation of a white ethno-state, then yes his opinions are opinions and not actions. His views are revolting but expressing them is protected speech. You accuse Knight of avoiding the crux of the issue, yet you’ve refused to answer multiple times on Twitter and in two blog articles as to whether you condone the assault on Spencer and to provide examples of what Spencer has done that goes beyond expressing horrendous ideas. If that’s not an avoidance of the crux of the issue then I’m Hitler. It’s amusing to me that in a discussion about whether attempting to silence views with physical violence is ethically justified, you attempt to do the same with hysterically hyperbolic statements in place of violence. “That’s if you’re not herding the minorities (into ovens) yourself.” Again, another disingenuous non-argument. Accuse people of a supressed desire to commit genocide and maybe they’ll stop talking about things I disagree with them about, right? I’m not sure if your mention of Tommy Robinson was a lazy and desperate segue or an equally lazy and desperate example of the guilt by association fallacy you seem keen on. But equating Knight with a neo-Nazi for giving a Pakistani ex-Muslim an opportunity to question Tommy Robinson uninterrupted is quite comically ridiculous. If you want to suggest that every single person that has ever interviewed Robinson without raking up his past or a stupid remark that’s been flogged to death, then that’s an awful lot of interviewers you’ll need to accuse of having a blind-spot for the far-right rather than a simple desire to cover new ground. You’re right about Israel though – he never criticises Israel! Except in GSPodcast episode 26. And a blog article. Oh and the fact that he has said that Israel is “potentially guilty of war crimes”. And the fact that he has said that their response seems “disproportionate and brutal”. And the fact that he has been called anti-Semitic for criticising Israel by people that are clearly as dedicated to logic and sincerity as you are. But all of that aside, perhaps Knight’s comparatively limited output on Israel and Zionism and free speech issues relating to them is the relative lack of prevalence in comparison to the calls for speech prohibitions by the regressive left or to Muslims attempting to shut down expression by invoking blasphemy law or by killing people. Or perhaps it’s because your “what about the jooooz? !” concerns are covered abundantly in other circles including by a multitude of protests and marches and demonstrations, and by the pathologically obsessed output of people like CJ Werleman and Asghar Bukhari. Still, some people he likes have views supportive of intervention in certain cases. Clearly the mark of a Nazi sympathising, warmongering hypocrite. I mean imagine being opposed to criminal assault against people for their views but not crippled by pacifism in regards to military intervention. It’s like a sensible and incredibly widely held attitude towards violence that corresponds with the constitution of the United States and with the U.S Supreme Court or something. What a coward. Hopefully one day we’ll all build up the courage it must take to avoid stating your own position on a topic in favour of trolling people anonymously on the internet. Bravery like that is rarity indeed. ‘Johnny’s’ response to this brutal rebuttal? It’s like the response of a humiliated child that has just been introduced to the unforgiving reality of ‘bigger boys’. Bob from Brockley is one of Arel’s co-thinkers. He agreed that a kick in the head, not merely a punch, would be appropriate. He didn’t even baulk at possible manslaughter charges. So far he hasn’t denied that he would extend the definition of fascist (who according to him deserves a street punch in the snoot) to people he thought were supporters of: Saddam, Assad, Rwandan government 1994, Rohingya Buddhists and Omar al-Bashir. I await his response to the ideologically tricky question of whether Linda Sarsour, co-organiser of the Washington DC Women’s March and Hamas supporter, deserves a righteous clocking. We still haven’t determined the minimum and maximum ages, nor the gender, which should be exempt from a good skullf*ck. Pretty soon, Bob and Dan are going to turn into a cartoon Popeye bing pow. An excellent response. Polite, and factually accurate, as always, Stephen. I have pointed out many times, perhaps here, but certainly elsewhere, “Johnny Spooner” is either a CJ Werleman sock, or one of his odious little fleas. I have also pointed out the account keeps on changing names. Like you, I have called out its lies on numerous occasions, and all it could do was resort to “you are all Nazis!” rhetoric. Dermot, yes I saw Bob’s response and was surprised by it. He did admit others, such as Islamists, are also OK to punch, or kick, etc. but when you open up this avenue, it always raises the question as to what standard you use, and which other groups are open to being punched. I have seen some argue that those religious people who believe abortion is murder, are then justified in punching abortion clinic staff. I would vehemently disagree…..but….the can of worms is open. guide to classical liberalism: defend loudly the right of Nazis to organize. remain noticeably silent on the reinstatement of torture. Bearing in mind many Islamists are basically Nazis, and bearing in mind most of the arguments used to justify punching Nazis can just as well be used to justify torturing them, I do wonder what his explanation of the difference would be. I admit I was a little torn on the whole punching Nazi deal. 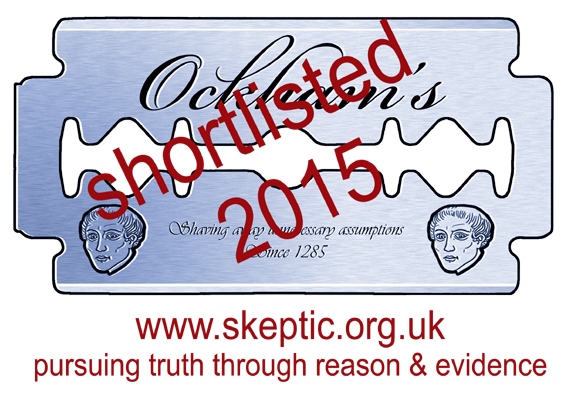 On careful reflection – you are right. I still can’t feel to sorry for Spencer but vigilante violence is wrong. If you follow The scathing atheist at all – Noah did an excellent “diatribe” on this subject in their latest episode.